Based off of the dance club lights of the 90's, MakerBar Member Tom Beattie tackles a 3D printing challenge to develop a LED 3D Printed disco light with DC motors and an Arduino, Relay, and Trellis controller board. 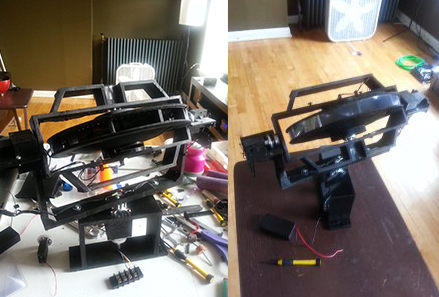 This project took over a year to build, and the first version was donated to MakerBot. It was featured in the Connecticut Retail Store for a year. (The stores have since closed).